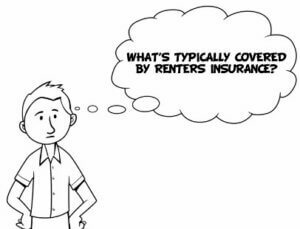 Renters insurance provides coverage for your lost, damaged, or stolen personal possessions. From furniture, electronics, clothing, all the way to silverware, soap and bath towels. It also provides coverage for injuries to another person that might occur in your rented home or apartment. For example, your friend trips and falls, breaking their leg in your apartment and the injury is deemed to be your fault, your friend can file a liability claim with your insurance to cover any medical costs associated with the injury. Your friend could also file a law suit against you, your renters insurance would pay for your legal defense, up to the limits set on your policy. These example costs would be your out of pocket responsibility if you don't have renters insurance. A renters insurance policy provides financial reimbursement to cover your lost or damaged possessions as a result of fire, theft or vandalism. Your possessions are not covered by the landlord's insurance policy. Their policy only covers damage to the building you are renting. It can be costly replacing all of your possessions. Think about every item you own: Silverware, dishes, towels, soap, food, cooking utensils, and that is only naming a few items in one room! It also covers "loss of use" which is temporary accomodations in the event that you have to live elsewhere while your rental is being repaired due to a covered loss such as fire, smoke, or water damage. This can include hotel bills, temporary rent payments and deposits. Lets say your neighbors bathtub floods or they leave a burning candle unattended and it sparks a fire causing damage to your rental unit. Chances are your home will not be in a liveable condition afterward forcing you to make alternative living arrangements. To obtain a free, no-obligation insurance quote, click below or call (877) 571-0926. $12,210 is a big number! That number is only counting four items per room and you most likely have more than that. You can see why Safeco renters insurance has a minimum content coverage of $20,000. No matter how you acquired your belongings, bought it, got it as a gift, found it, why not protect all that matters to you!